Clouds are more than nice embellishments in the sky, they also say something about the weather. The term congestus clouds may be unfamiliar to many but its features and appearance are not. Whether you are a cloud enthusiast or not, knowing more about congestus cloud formation will enhance your cloud watching activity. Congestus is a Latin word that means piled up, indicating that this cloud specie is only found in the cumulus family. It has a distinctive upper element which is quite lofty that it is commonly referred to as the “towering cumulus”. Due to its vertical development, congestus can produce short light rain and further grow into cumulonimbus cloud. A congestus cloud develops next to cumulus mediocris and can exhibit beautiful dark-hued rays if the sky is slightly foggy and could also distribute sunlight well. At What Altitude is Congestus Clouds Found? Because it is a vertical growing cloud, its base can be found from as low as 2,000 feet from the ground and reach up to 20,000 feet in the atmosphere. Congestus clouds are basically taller than wider. They come into being due to strong updrafts which cause bouncy rides for airplane passengers. Even so, congestus clouds do not present any serious risk on airplane safety. How is Congestus Clouds Formed? A congestus cloud forms due to the convection of warm air and atmospheric instability. It occurs as soon as the temperature of the surrounding mass of air drops down more quickly with height due to the sliding of cool air current onto the cloud. With strong convection and more unstable atmosphere, the congestus cloud may further develop into a cumulonimbus cloud. 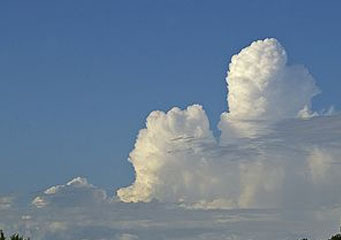 Congestus may form when cumulus mediocris dissipates. It may also grow when stratocumulus and altocumulus castellanus vanish as well. What do Congestus Clouds look Like? The congestus’ towering cloud closely resembles a cauliflower. Normally, these clouds have a flat base with pointed outline. The towering top of a congestus cloud can grow up to 6 kilometers or more in tropical regions. When you notice a smooth, void or fibrous element on its tower, it has transformed into a cumulonimbus calvus. How Common are Congestus Clouds? Congestus can be seen worldwide except in the Antarctica region. This cloud formation can produce prolonged rain showers or snow. In North America, the cumulus congestus can generate significant snowfall. Congestus clouds are not just beautiful features in the sky. It strongly implies turbulence up in the sky.